When purchasing or selling an ATV, UTV or Dirt Bike in Alaska you always want to document the transfer of vehicle from the seller to the buyer. Typically this is done by signing the “Transfer by Owner” or “Assignment” section on the rear of the original title. We also suggest securing a valid Alaska bill of sale to properly document the sale including the sales price, condition of the vehicle, and hold harmless language to protect the buyer and seller. 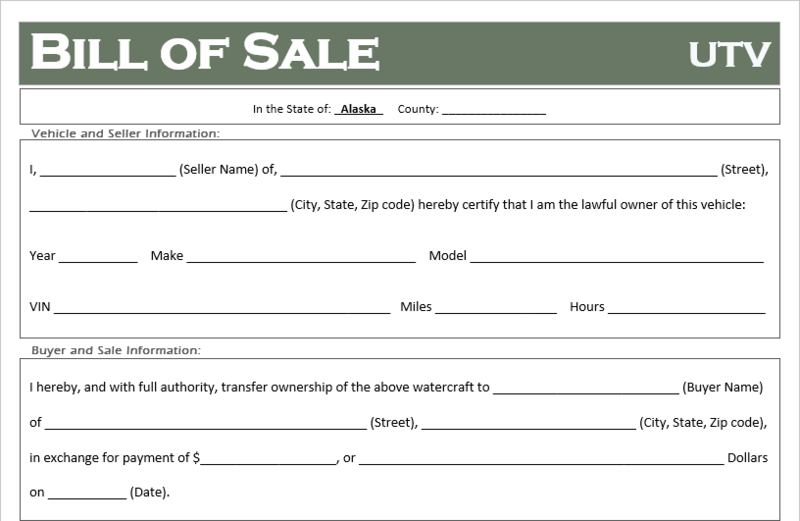 Why Do You Need a Bill of Sale in Alaska? 1. These vehicles can be very expensive. Whether you giving or receiving cash for an item, you want proof of the transaction in the event someone makes a claim against ownership (if you are the buyer) or if someone is injured on the vehicle (if you are the seller). It is a simple form of insurance. 2. Alaska requires the vehicle be registered with the state before use. Applying for registration will require the owner to provide proof of ownership before the vehicle can be registered. In short, a properly executed Bill of Sale will protect you from future liabilities and allow you to register the vehicle. What Does a Bill of Sale Need to be Valid? Offer: The agreement to exchange the vehicle for an amount of money. May also include conditions of the sale for the buyer and the seller. Consideration: The amount of money being exchanged. Usually in a numeric and written form. Acceptance: Signatures of both parties on the bill of sale. Competent Parties and Legal Intent: Both parties entering the contract must be competent (age, mental capacity, and not impaired or forced). The contract is also valid only if it is lawful. A contract to complete an illegal act is not binding. What Should the Buyer do with the Bill of Sale? If you are applying for vehicle registration most states now have an online registration portal you can use, in which case you will need an electronic copy of the document. Does the Seller Need a Copy? We also suggest both the seller keep a copy of the Bill of Sale, and the buyer keep the original. This will ensure the seller can document the sale of their vehicle if property is damaged or someone is injured during its use.